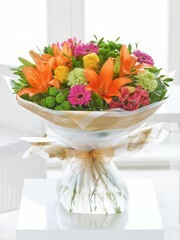 Lillies are a beautiful blooming flower, Stonehaven flowers have beautiful lilies including Asiatic lilies and Oriental lilies, which come in a few different colours. Stonehaven florist aim to provide beautiful flowers and our flowers are of the freshest and highest standard we can get, by having them directly imported from Holland. Sometimes when the flowers are delivered not all of the lily head will have opened this is because of their freshness, there are many benefits to this and a longer life for the flowers is one of them. 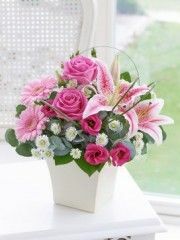 When ordering lilies for someone there are a few things to consider, its is advisable not to send lilies to someone who has cats as the pollen from lilies is highly poisonous to cats. The pollen can also stain clothing and furniture so they need to be handled with care. Stonehaven flowers recommend choosing an alternative bouquet of flowers for a cat owner that you would like to send flowers to, roses are a great option. Stonehaven florist can deliver your lilies the same day as you place your order, perfect for if you need the flowers to be delivered asap. 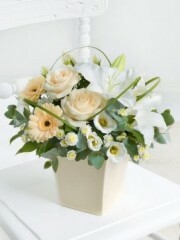 We have a standard delivery option too for next day or any date of your choice. 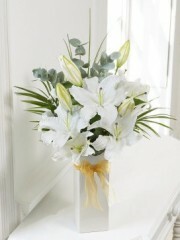 Stonehaven flowers have a range of bouquets including lilies and also bouquets made up only of lilies.